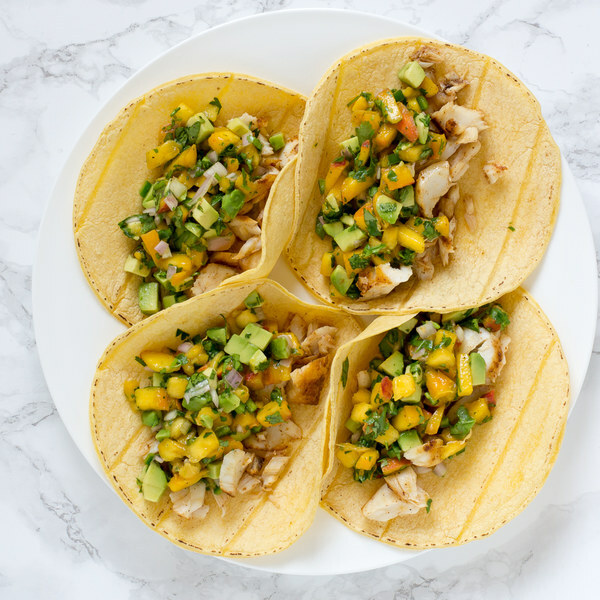 ← Fish Tacos with Avocado-Peach Salsa. Wash and dry the fresh produce. Quarter the peaches lengthwise (around the pit) and twist the quarters to separate, then remove and discard the pit; small dice the quarters into ¼-inch cubes. Transfer to a medium bowl (that will hold the salsa). Halve the avocados lengthwise and twist the halves to separate, then remove the pit with a knife or spoon; scoop out and small dice the flesh into ¼-inch cubes. Add to the salsa bowl. Quarter the jalapeño peppers lengthwise; remove and discard the stem, seeds, and membranes. Finely dice the peppers and add to the salsa bowl. Using a knife, shave the cilantro leaves off the stems at a downward angle, working away from your body; discard the stems and finely chop the leaves. Add to the salsa bowl. Trim off and discard the ends of the shallots; peel and finely dice the shallots. Add to the salsa bowl. Add olive oil to a nonstick skillet and preheat over medium heat. While the skillet heats up, pat the fish dry with paper towels and place on a plate; season with chili powder, salt, and pepper on both sides. Once the skillet is hot, add the fish; cook until it is cooked through and flakes easily, 2 to 4 minutes per side. Once done, transfer to a plate. Juice the lime and add to the salsa bowl. Season the salsa with salt and pepper; toss to combine. Wrap the tortillas in damp paper towels and microwave until heated through, 15 to 30 seconds. Using a fork or your hands, flake the fish. To serve, divide the fish between the tortillas and top with the avocado-peach salsa. Enjoy!